Founded in 1974 in Monterey, California, CyberData Corporation is a leading design and manufacturing firm with more than 40 years of experience. They place special emphasis on developing and manufacturing well thought-out products which provide outstanding quality, functionality, design and durability. CyberData products have an unsurpassed reputation for ease-of-use, reliability, and connectivity. We have put this information together to make sure you don’t overlook anything before ordering. If your secure/door entry project is indoors, then do not opt for the IP65 Stainless Steel Outdoor option. When Outdoor Intercoms are installed in indoor environments, such as inside your customer’s office corridor. You may experience: Clipping audio, low audio, no audio, etc. This is the result of the intercom’s echo canceller trying to “tune” to the indoor environment by adjusting the microphone and speaker levels as it picks up audio. Outdoor Intercom’s echo cancellers expect at least 40 dB of ambient background noise. Make sure you are integrating to an approved IP Phone System (IP-PBX/SIP Server). CyberData is compatible with 36 IP Phone systems. It works well with hosted platforms. Most hosted platforms are built on Asterisk and Boradsoft platforms. CyberData was certified by Digium (who make Asterisk) in 2007. Its certified by Broadsoft. Direct certification also from Cisco, Presence Management for LG IPECS, NEC, Nortel, Alcatel. Directly certified by Mitels SIP Centre Of Excellence team and many more. If you are using a hosted solution, we advise to check what manufacturer is the backbone of that system. Check the full list here ( each manufacturer has been “On-board” (involved) with the Interoperability. Even though the Adaptive Full Duplex mode of the VoIP Intercom compensates for most ambient noise, it cannot remove the noise of trucks, cars, or other high noise sources directly in-front of the Intercom. Noise reduction can be improved by mounting the Intercom at a location that shields and directs the sound to and from the user (such as a tube or recessed housing). This option is for noisy environments. When enabled, the microphone will be muted normally. When the Call button is pressed and held, it will unmute the microphone and allow the visitor to send audio back. Using Push to Talk prevents the visitor from terminating a call by pressing the Call button. The call must be terminated by the phone user. For extremely loud application, for example an airport. You can upgrade your outdoor door/barrier phone to the Advanced Processor option. The intercoms board features a separate processor made by Alango Technologies. Alangos customers include Airbus, Motorola and Plantronics. 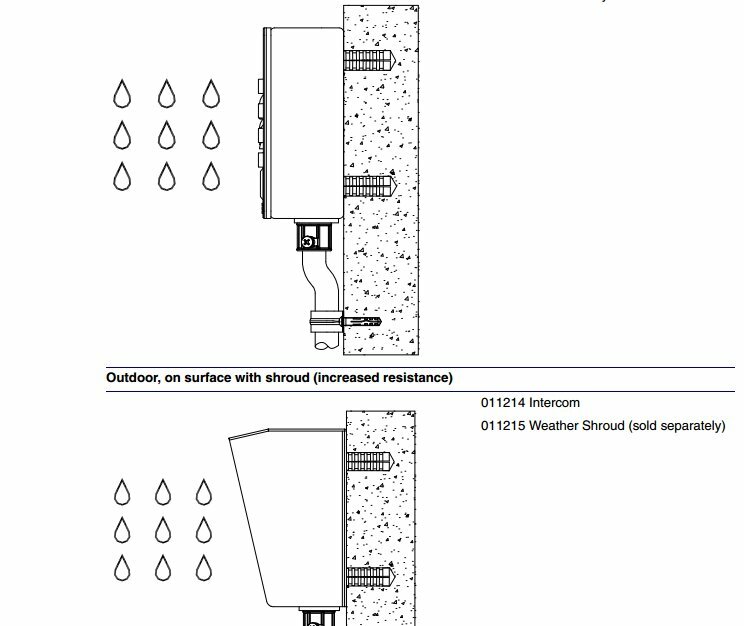 Outdoor Intercom options are available with an optional weather shroud. Not compulsory to purchase. Historically, 9 of 10 customers buy the shroud. The unit is IP65 and stainless steel regardless. The Shroud helps keep rain off. The operations guide by CyberData is very detailed and informative. Each device and product page has its own opps guide. We advise you to read before you buy. The device has a built-in relay that can be activated by a web configurable DTMF string that can be received from a VoIP phone supporting out of band (RFC2833) DTMF as well as a number of other triggering events. In a typical set up the outdoor secure entry phone is located at site entry points. The NO (Normally Open) contacts trigger a gate or barriers controller unit. In a typical set up, the dry relay contact triggers an external relay. The external relay is usually in place. The relay contacts are dry and provided for a normally open and momentarily closed configuration. Neither the alternate power input nor PoE power can be used to drive a door strike directly. The relay interface also has a general purpose input port that can be used to monitor an external switch and generate an event. Most existing buildings with door entry points, will have an external relay in place. For example, to power your Maglock, Old Intercom, Push to Exit Button etc. The on-board dry relay contact (as pictured above) controls the power of the external relay. Which then opens the door (shown in the diagram below). If your secure entry application is part of a new build, please don’t make the mistake of thinking a PoE driven Intercom can drive a high powered door lock. You would need an external relay in place. This will be perfectly understood by the installer. We encourage anyone buying the Door entry phones for a Panasonic IP Phone System, to double check the following. The SIP Intercom supports DTMF delivery RFC2833 out of band. This is the adopted standard for DTMF delivery. 99.99% of IP Phones deliver DTMF in “out of band RFC2833”. 3CX, Avaya, Broadsoft, Cisco, Mitel, NEC and 30 other manufacturers that support CyberData, use this method. However, Panasonic don’t seem to. Triggering the on-board relay and opening a door may be a problem. Please look into this.